It’s 1972 in windswept Edinburgh and five young lads have become caught up in the national sequin shortage. Scotland is not known for its proliferation of glam rock bands for good reason. Aside from Molls Myre, whose very modest success was largely self-awarding, and Salvation, who are known for being Midge Ure’s first band of note before quickly abandoning glam for pure pop and changing their name to Slik, there was little to get the local guys and gals donning their make-up and extravagant footwear. The exception was Iron Virgin – a band who came so close to success that even now, careering towards fifty years later, it seems inexplicable that they aren’t household names. Stuart Harper (vocals); Gordon Nicol (Guitar); Lawrie Riva (Guitar); Marshall Bain (Bass); John Lovatt (drums) were a band who did it the old way and, by any standards, the best way – by relentless gigging and writing songs which would stick limpet-like in audience’s minds. There was image to consider, naturally. In keeping with matters of the moment, John took it upon himself to dress like a droog from A Clockwork Orange, a film which was inspiring look-a-like gangs throughout Britain, with white boiler suit, boots and bowler all accounted for. Using a section of Wendy Carlos’ score as entrance music onstage, this would have been glaring enough but this still doesn’t account for the remaining members who certainly hadn’t held back on their parts to get noticed. Fashion within the Iron Virgin camp went from expected glam fare (lamé; blouses; flares; platforms; expansive barnets) to the less familiar. Quite what the logic was to dress as American footballers is lost to the ages, though this suggests there was any logic. 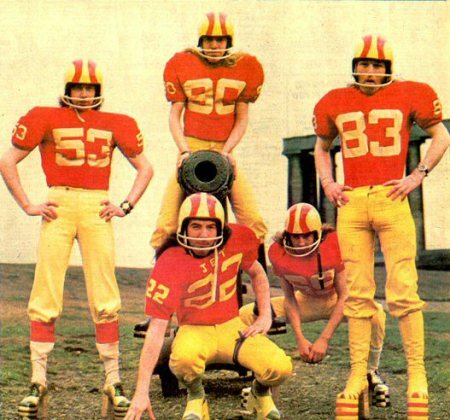 Of course, they weren’t ACTUAL American Football kit – baggy shirts were daubed with numerals and stuffed beneath with padding to give the impression of either muscularity or armour. Motorcycle crash helmets doubled for the real thing, with aluminium piping affixed to resemble the helmet grate. Yellow loon pants should have completed the outfits but no, external codpieces bearing the legend, “No Entry”, were donned. 1972 – the IRA; The Vietnam War; Iron Virgin. By 1973 their talent had been noticed by Nick Tauber, a producer whose credits include Thin Lizzy, Marillion and Toyah, though at the time, he had them signed, sealed and delivered to Decca’s more adventurous imprint, Deram. Having already gained something of a reputation by featuring Bowie, The Moody Blues and Procol Harem on the label, Deram were a platform, if you pardon the pun, from which genuine stardom was achievable. With their own material well-rehearsed and a reliable live unit who had a sizable fan following, they now found themselves in the extraordinary position of being given the green light by Paul McCartney to cover one of his new tracks. The song was “Jet”, and had appeared on the just-released Wings album, Band on the Run. Iron Virgin’s version of one of Macca’s most famous non-Beatles tracks is actually extremely good. There are no histrionics or silly curveballs just for the sake of it, it’s a strong, rocky take on a familiar song. What could possibly go wrong? Everything, naturally. Airplay was gathering pace, not least when Emperor Rosko featured it on his influential Round Table Show. At a time when national radio was a magic key to adoration and wealth, this was the breakthrough they were waiting for. Then, oddly, the release date was delayed. Rumours circulated that they had gone top ten in Holland. Iron Virgin felt a bit better. Then Macca decided he liked the track more than he first thought. He was releasing it himself and that was the end of that. As is often the case, this information was fed back to the band in a combination of shrugs and waffle, painting McCartney as the villain, destroying careers of poor chaps from the rainy wastes of Scotland like Zeus crushing his enemies. In fact, it’s far more likely that Deram never asked permission for the song to be covered and crossed their fingers that by the time they were rumbled, sales would already be flooding in and they’d be readying the next, less dicey, release. Dejected, the band released their follow-up in 1974, Rebels Rule, a thumping glam masterpiece which had the zip of Suzi Quatro’s Devil Gate Drive and shades of Alice Cooper, though comparing the track to The Runaways’ “California Paradise”, you might wonder if it isn’t too late for litigation. Inexplicably, the single didn’t chart. The unforgiving nature of the charts system in the 1970’s meant that there wasn’t academic scrutinising over whys, ifs and hows – Top of the Pops and Radio One weaved their magic and stars were made. You missed out? Tough. You want worse news? You’re probably going to get dropped too. Incredibly, demand for the single now is higher than it was in 1974, with copies selling for around the £40 mark on eBay. This is in a large point due to the singles inclusion on Velvet Tinmine, one of a series of albums released by RPM bringing together some of the great singles from the glam era which missed out on glory the first time around. As the lead track, it even received praise from the reviewer at The New York Times. Deram’s haplessness at promoting the band cannot be overstated. A suggestion for a photoshoot of the band in Trafalgar Square biting the heads off budgies SHOULD be apocryphal though, sadly, is true. Though a couple more passable cover versions were recorded (and brought together on a now sold-out album in 2007), the band disbanded, going on to such varied careers as tie designers, poets and managing and producing eccentric acts. If there’s a lesson to be learned, we’re not quite sure what it is.